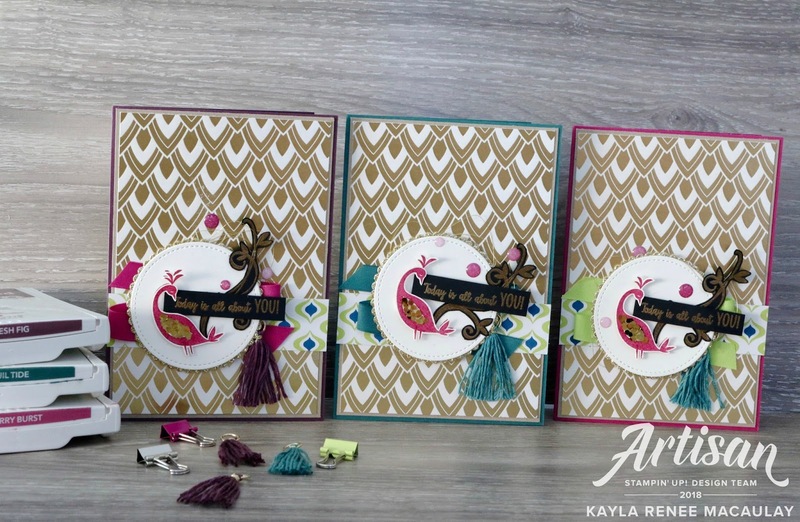 I am really excited to be here sharing with you a set of three cards I made using one of my favourite new FREE Sale-a-Bration choices, Beautiful Peacock. For those that know me well will know that I have had a long term obsession with peacocks, the colours in the feathers are always breathtaking. I loved that Stampin' Up! brought out a peacock stamp set and I just couldn't wait to start playing around with it. 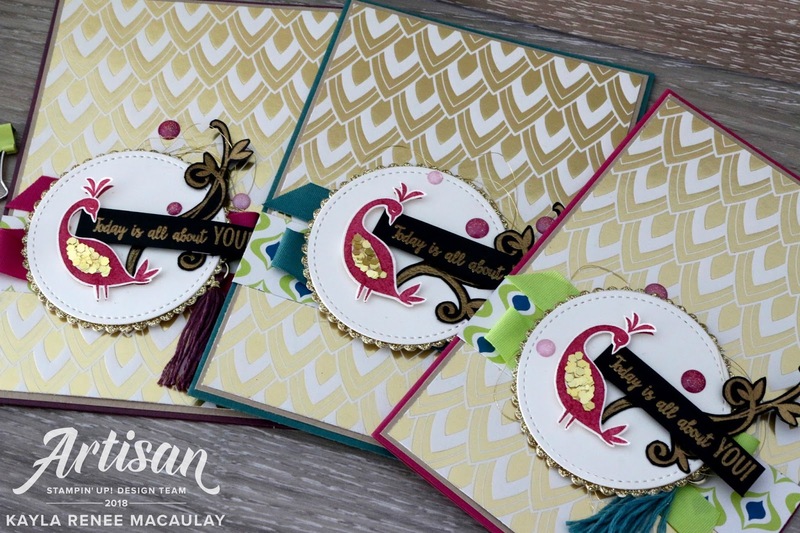 I have taken to making cards in sets with small changes with colours and patterns so I have plenty to give out and it makes card production so much more time efficient, plus I really just love working in threes. Haha! I immediately thought of the Eastern Palace suite from the annual catalogue when I thought of the peacock stamp set because of the rich regal colours, so I actually based my initial inspiration for these cards directly from that suite. I pulled out the gorgeous Eastern Palace Designer Series paper and those gorgeous tassels that coordinate with the suite to start me off. I based most of my design around those elements. I went with the colours; Berry Burst, Tranquil Tide and Fresh Fig as my main sources of colour with of course Gold because I just love a bit of metallic! 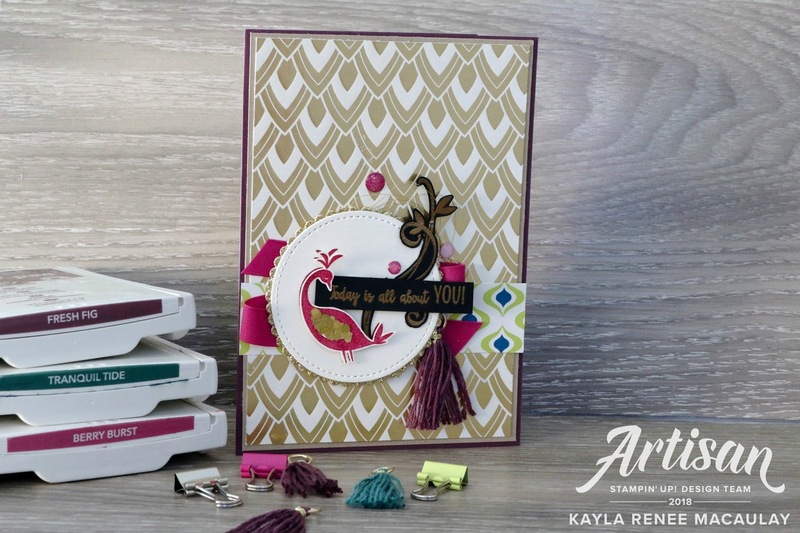 I loved the combination of Fresh Fig with the Berry Burst for this card. I actually stamped the peacock once onto the background Whisper White Stitched shape and then stamped it again, fussy cut and mounted it onto dimensionals. I stamped the tail feathers on Basic Black cardstock with Versamark ink and embossed in Gold embossing powder. I also fussy cut this out and placed it behind my peacock. 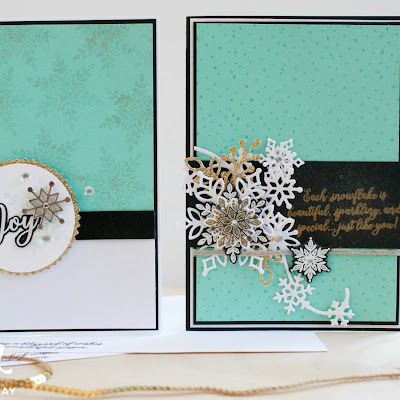 I love the added texture that the embossing gives the card. I also heat embossed the great sentiment and raised this up on dimensionals also. I love the simplicity of the sentiment and it really could be used for anything. 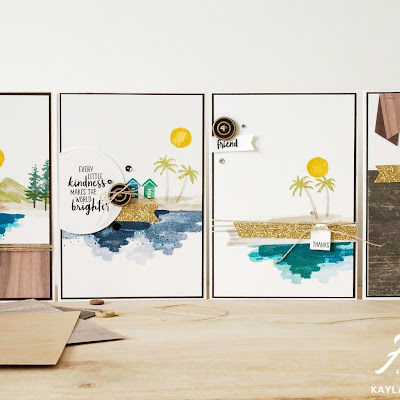 This next card uses one of the favourite 2017-2019 In Colours, the gorgeous Tranquil Tide. I just love the gorgeous regal tone of this colour and love that I had a tassel to match! It looks great wiht the Gold and a touch a Lemon Lime Twist. Other than those slight changes, I kept the rest of the elements same. I won't lie, I am a huge fan of brights so the beautiful bright Berry Burst and Lemon Lime Twist together melt my heart. I just love bright and nature of those colours. As you can see from this close up I have also used some of the gorgeous Gold Glimmer Flakes from the Valentines suite (Painted with Love) from the Occasions catalogue to make the Peacocks wings nice and shiny and somewhat a feature of the peacock. Nothing better than a bit of shimmer and shine. 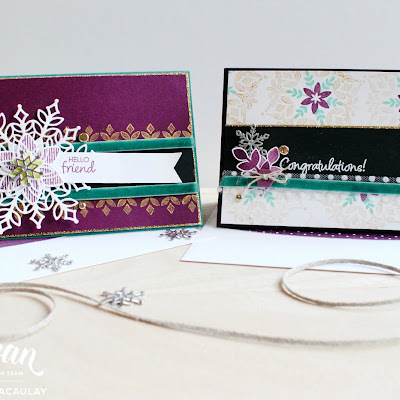 I hope you enjoyed a look at this set of cards I made using one of the great Sale-a-Bration sets. 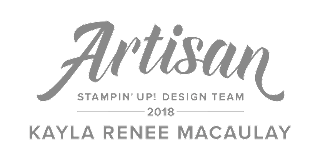 You can see all the products I have used linked below this post which will take you directly to my store to purchase if you wish. Don't forget that if you spend $90 at the moment with me in my store you can choose to get this fabulous BEAUTIFUL PEACOCK stamp set FREE with your order. It's a great time to shop for your crafty hobby.